Hello! Here is another set of brushes. Inside are all sorts of screw heads. Most are old, dented and rusty ones - great for grunge effects. I've also added a cleaner version for some of the brushes to give them a less worn look. 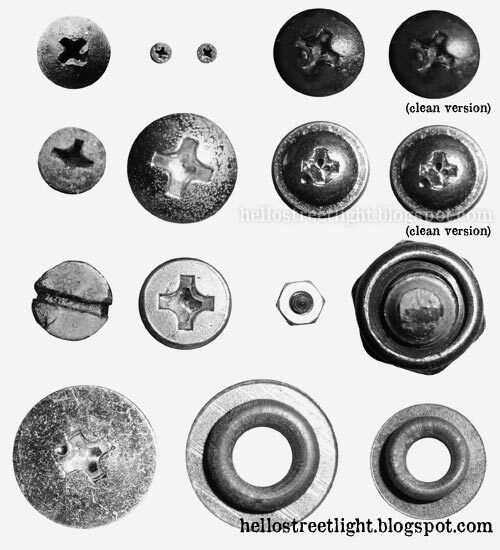 Aside from screws I also threw in some extra nuts and washers.. Anyway as always, hope you find these useful. Enjoy! 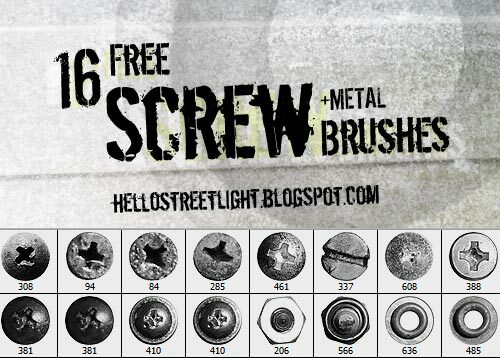 Rotate the brushes (Window » Brushes or F5) to get variation with the screws. Just note that its highlights and shadows will also be rotated, which can produce inconsistencies on your lighting. Try adding a Drop Shadow and/or Bevel and Emboss layer effect. Experiment on duplicating the layers for the screws and adjusting its blending modes. Wow! Great site. I am impressed with all of your work. Thank you so much for sharing!